From 30+ years of experience as a performance improvement consultant, self-assessment team leader, and trainer, Fred Forck, CPT, understands what you need to get a cause analysis done. He leads you through a clear step-by-step process of root cause evaluation, quality improvement, and corrective action. Using these straightforward tools, you can avoid errors, increase reliability, enhance performance, and improve bottom-line results — while creating a resilient culture that avoids repeat failures. At each stage, Cause Analysis Manual: Incident Investigation Method and Techniques gives you a wealth of real-world examples, models, thought-provoking discussion questions, and ready-to-use checklists and forms. His background is impressive. Fred’s first paying jobs as a young man were as a farm worker, janitor, and laborer. Fred began with dual undergraduate degrees — chemistry and secondary education — and he has put both into practice. For the first nine years of his career, Fred taught high school chemistry, physics, science, and math, while coaching varsity softball, junior high basketball, and Little League baseball. No stranger to hard work, when school was out, Fred found jobs as a bricklayer and bus driver. In the rest of his spare time, he served in Missouri National Guard military police units, advancing to detachment and company commander for four different units. In 1982 Fred joined Quality Assurance (QA) at Callaway Nuclear Power Plant while the station was still under construction. As QA training supervisor, Fred developed the initial auditor and lead auditor training for the Callaway plant. He supervised the QA operations support group. As a certified lead auditor, Fred led inspections of vendors, chemistry, health physics, training, environmental monitoring, and corrective action. He also led the first self-assessment of industrial safety at the Callaway plant. 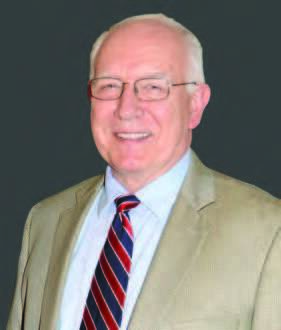 At Callaway and at Palo Verde Nuclear Generating Stations, Fred developed the root cause analysis (RCA) training programs and compiled root cause manuals for both stations (the latter for Palo Verde’s regulatory recovery). At Callaway, Fred participated on over 90 root cause investigations generally as the lead investigator or the mentor. Besides participating in five common cause analyses, Fred developed and delivered the station’s common cause analysis training. In 1999, Fred participated on a Nuclear Energy Institute (NEI) team that benchmarked best corrective action processes in the nuclear industry. Fred’s final position at Callaway was root cause analysis coordinator. He has recent qualifications as a root cause analyst at Palo Verde, Ft. Calhoun, Tennessee Valley Authority (TVA), and Entergy nuclear stations. He was the lead RCA investigator for Fort Calhoun station’s Nuclear Regulatory Commission (NRC) 95002 inspection and qualified as a root cause subject matter expert at TVA’s Browns Ferry nuclear plant to support the NRC’s 95003 inspection. After Duke Energy completed its merger with Progress Energy in 2012, Fred consolidated the corrective action and cause analysis programs of both utilities into a single set of procedures. His most recent work has been with Entergy Nuclear as an investigator to support the Arkansas Nuclear One (ANO) 95003 regulatory recovery and the River Bend Nuclear Generating Station 95001 regulatory recovery. Nuclear stations share information and people freely. Fred participated on corrective action audit and assessment teams at Davis-Besse, Indian Point, and Wolf Creek. While he served as Callaway’s human performance supervisor, Fred helped facilitate a human performance gap analysis at Prairie Island. He was a member of the organizational effectiveness assessment team sponsored by the Institute of Nuclear Power Operations (INPO) at South Texas. He was on the industry team that developed and presented INPO training on performance indicators and latent organizational weaknesses. Fred participated on INPO’s first ever assessment of latent organizational weaknesses which was conducted at Grand Gulf Nuclear Station. His role was to complete the common cause analysis of the station’s investigations. He supported other teams using common cause analysis to determine root causes of Diablo Canyon’s and Point Beach’s cross-cutting issues in human performance (HU). Fred has integrated HU fundamentals into Callaway’s auditor and root cause training and into the corrective action program. He helped develop Callaway’s first HU lesson plans. Later, he helped develop coaching training and taught portions of the supervisory skills training. Fred is a past secretary of the HPRCT. He was on the planning committees for the 1996, 1998, 1999, and 2008 HPRCT conferences and served as the chairperson of the 1999 conference. He was the conference lead for the Self-Assessment/Safety Culture track in 2007 and for the Root Cause track in 2008. In 2007, Fred was designated as a Certified Performance Technologist (CPT) in accordance with the International Society of Performance Improvement (ISPI) standards. î¢is certification is a reflection of Fred’s work for over 35 years improving workplace performance by focusing on organizational assessment, incident investigation, continuous improvement, and safety culture. Fred’s hobbies include studying scriptures and researching the ancestors of his parents: the Forck and Wolters families on his father’s side and the Taube and Schnieders families on his mother’s side. He has completed a line-by-line study of every book of the New Testament except for Revelation. He loves languages and, in the distant past, has studied German, Latin, French, Spanish, and Italian. Most recently, he has become interested in Mandarin Chinese. But his most fun hobby now that his children are grown is reliving his childhood through the eyes of his four granddaughters and his brand-new grandson. “This book collects decades of experience and comprehensive knowledge into a comprehensive manual on manners, methods and techniques to do cause analyses when it comes to incident investigation. The main content is outlined along a 7 step procedure that provides clear guidance even for less experienced people. This is a helpful, didactic approach. “Following this 7 steps approach makes it easy to understand the concepts and how they are related. Still the author emphasizes that the book is not a procedure. It provides options and a wealth of practical insights that finally have to be governed by the corrective action procedure of a specific business. Therefore it is helpful in any business and in any incident investigation context. It’s major strength though is that it is practical. Even a newcomer to the field understands immediately what is important to do, how to do it and how to analyze results. “Thus the book is highly recommended for newcomers as well as experienced practitioners. Everybody will gain from it. For the ones that have a background in performance improvement: The book is also based on the four principles of the International Society for Performance Improvement. Pinpointing a problem (Step 1). Finding the factors that allowed the problem to exist in your organization (Steps 2-5). Developing action plans to fix and improve behaviors or processes (Step 6). Writing investigation reports for decision-makers (Step 7). Years of professional experience have shown me that significant business incidents have causes hidden within the organization and its programs. I recommend that, as an investigator, you use Cause Analysis Manual’s techniques in combination with the systematic seven-step methodology outlined here. Used accordingly, you will be able to find underlying causes and develop corrective action plans that are effective in preventing similar business incidents in the future. Once you have determined an incident’s contributing factors, the manual focuses on achieving business Results (R) by assuring organizational Behaviors (B) are aligned. Changed, improved, business Performance (P) in the future is the overall goal of corrective action planning. Organizations reasonably plan for all job performers to succeed at their given tasks. Businesses want to prevent problems and to learn all they can from significant incidents so lives, practices, and cultures can be improved. Organizations routinely anticipate how a job performer might fail at a task and put plans in place to remove failure paths. Despite these best efforts, organizations still experience significant incidents, near misses, or adverse trends. Focus on results and help clients focus on results. Look at situations systemically, taking into consideration the larger context, including competing pressures, resource constraints, and anticipated changes. Add value in how you do the work and through the work itself. Use partnerships or collaborate with clients and other experts as needed. It’s success-based cause analysis. My colleagues and I focus on the planned success path — how the organization intended to get the desired result from people, processes, and programs. It focuses on structure and flexibility. We are aware of and use structured models frequently. Because we have so many models in our mental toolkits, we are very flexible in finding beginning structures when we help people address issues. It celebrates the differences. Many companies are looking at how they have different definitions or different processes and then dwell on why the other company’s definition is wrong or why their process is flawed. We tend to see the differences as building blocks to grow better processes. We actually see the goodness and usefulness of what others do. It’s a product of our own cooking. Whether it’s focusing on success or using structure or celebrating differences, we practice what we preach or intend to sell to someone else. Every technique described in this book has been tested and has proved successful in companies like yours — and the process has been refined based on this experience and the suggestions of clients and experts. 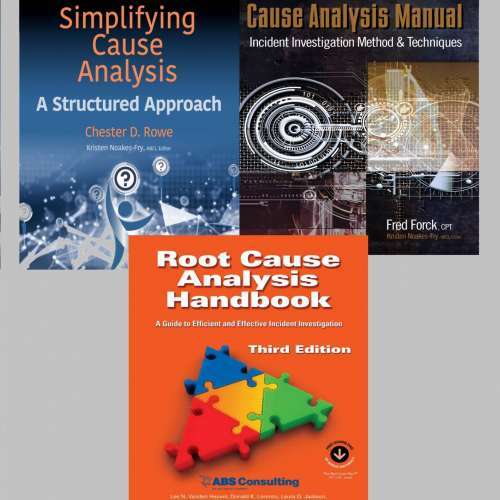 Before you use Cause Analysis Manual, it would be helpful, but not necessary, for you to attend an approved root cause analysis or incident investigation class. However, by using the manual, you will find out how to achieve the same results without the benefit of formal training. This text is for reference only — it is not a procedure. The manual provides options on how to satisfy regulatory requirements, license commitments, and business obligations. However, the governing corrective action procedure of your business should specify when the analyses will be performed and other business requirements. This manual is intended to convey expectations on the manner, methods, and techniques that are acceptable for performing a cause analysis. The actions described in the manual do not need to be performed in the sequence listed. The order given here is a recommendation only. The final sequence of the actions you use should be based on the specific conditions encountered during the investigation. My experience has shown that usually the investigation, root cause analysis, and report writing processes are iterative rather than sequential. I have been fortunate to have known and worked with Fred Forck for over 30 years. My first encounter with Fred was he was the instructor in Quality Assurance. Fred spent a good portion of class explaining why the rules and regulations made good business sense, often reminding the class that “quality” was just a synonym for “good.” When I reflect, much of my success can be attributed to this seemingly simple concept! Fred started his career as a teacher — and he is always teaching and learning. Too often in the arena of Cause Analysis, you come across either theorists or what I call “checklist” cause analysts. However, in contrast, Fred is a true craftsman of root cause analysis. He has successfully applied his craft to many incidents ranging from equipment failures to organizational failures. Although most of his experience has been in the nuclear power generation field, Fred’s techniques and tools are basic to any endeavor involving humans, organizations, processes and machines. Over the years, Fred has taken insights on human behavior and the associated drivers to get the desired behaviors and integrated this with organizations and processes to demonstrate how to get desired results. 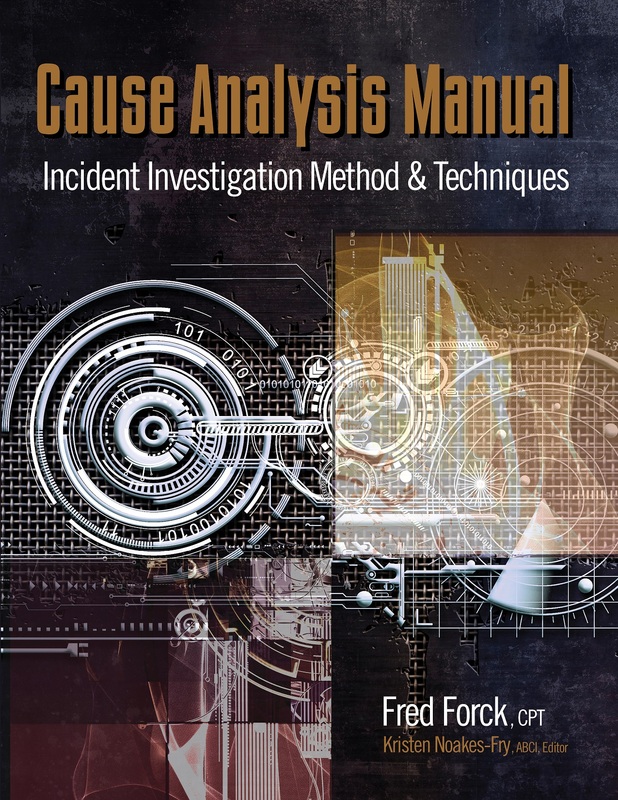 Cause Analysis Manual: Incident Investigation Method and Techniques is different and better than other cause analysis material because it incorporates what Fred has learned and successfully applied from many other cause analysis practitioners over the past 30 years! This will become apparent as you note the numerous References and Further Reading at the end of each chapter. This book contains Fred’s lessons learned from a variety of experiences and molds them into a comprehensive, yet simple, method for cause analysis. He presents a simple seven-step process for performing a cause analysis. But for each step, the book provides multiple tools, techniques, and ideas applicable to different situations. As Fred always does, he provides the reasons when and why a tool or techniques should be used. This book also offers the added benefit of providing guidance on the “management” of the cause analysis process. Again, this is based on Fred’s extensive experiences and understanding the impact this has on the success of the cause analysis effort. This management component includes team formation, roles and responsibilities of cause analyst and Team Leader, collecting and managing evidence and data, and report writing. Most importantly, Fred describes the critical steps in the cause analysis process in which management’s engagement is crucial. I first met Fred Forck around 2001 at an industry conference for practitioners of human performance improvement, root cause analysis, and trending. He impressed me as a soft spoken, personable, clean living fellow, intensely interested in solving problems. We both worked at nuclear power plants at the time, but Fred soon moved on to a successful consulting career. Several years afterwards, I led a root cause analysis team at a Midwestern nuclear plant. In four days, we created a creditable analysis report with all the constituent parts, causes, extents of cause and condition, corrective actions, etc. – an “accurate, auditable and defensible record,” as Fred would say. Near the end of my last day with the team, as we chatted about our work together, Fred’s name came up. Someone remarked, “Yes, Fred came in, put everything on a chart, and the answer just popped out!” His skill at handling the team and applying his process made it all seem easy and straightforward. It was an eye-opener I’ve never forgotten! I am writing this Foreword because focused, effective cause analysis is rare and Cause Analysis Manual: Incident Investigation Method and Techniques can make it less so. In this book, Fred has distilled a lifetime of learning and experience into a cogent, practical manual anyone can use to understand and apply proven methods and techniques to solve problems, improve the enterprise, and prevent similar problems from happening again. Fred begins with a survey of concepts, objectives, methods and techniques for cause analysis. Just enough background to help you construct the mindset you need to do the job. The book employs graphics that beautifully illustrate what to do, why, and how to do it. Fred doesn’t stop at conceptual diagrams or process maps. He includes practical tools: checklists and worksheets that guide the user through the process step-by-step. The worksheets are information-mapped to capture the critical information in a logical, assessable format. For example, instead of a traditional personal statement “form” that is mostly a blank page, Fred gives us a “witness recollection statement” that assembles details about who is making the statement, the witness’ job as it related to the event, and a statement of the problem in the subject’s own words. The form ends by asking the witness what he or she recommends should be done differently. Every investigator should have this form in his toolkit and use it religiously. Looking at it, I see the distillation of the wisdom of vast knowledge and experience into a finely tuned instrument for evoking and capturing the invisible influences that shape the human side of events. This sort of virtuosity is routine throughout the book. As the book progresses, each step in the process is dissected and explained with multiple examples, practical tools and advice. Each fundamental is reinforced in context with each step in the process until the reader becomes committed to the necessity for completing each step in turn – no shortcuts. Warnings and admonitions are strategically placed to help the user avoid pitfalls that could take years to ferret out on your own. From his straightforward integration of management and investigator responsibilities to his unflinching approach to what to do when the manager is accountable, the book gives you the method and techniques to succeed. It is clear to me this manual was written by a master of the craft. It is more than a roadmap. Applied conscientiously, it is a vehicle to carry you from your first reaction to a bad outcome to deep understanding of how and why it happened, and a set of actions to keep it from happening again. I have had the pleasure of both a personal and professional relationship with Fred since 1983. He has a professional passion for solving problems in the workplace, and I have benefited from Fred’s wisdom and expertise to solve problems in a highly technical and potentially high-risk industry — commercial nuclear power. I recall an early success with a nuclear power company: The use of new inspection assessment tools had caused the Nuclear Regulatory Commission (NRC) to develop concerns with collective radiation dose. As the issue evolved, an urgent need for a root cause analysis emerged. Using Fred’s tools and guidance, we identified the drivers of an organization’s undesirable behaviors and developed and implemented the necessary corrective action plan. The results spoke for themselves. Collective radiation dose improved dramatically, and the NRC confidence was restored in the licensee performance. Significant collateral benefits were also realized. Because of the improved work planning, refueling outage cost and schedule also improved significantly. Cause Analysis Manual: Incident Investigation Method and Techniques represents years of applied research in the field of root cause analysis. Because Fred is also an educator, he wants us to benefit from what he has learned. The book presents a positive approach to solving problems by considering “what does good look like?” early in the process. Fred recognizes we are running businesses and do not have infinite resources at our disposal, and so he offers tools that managers can apply to make confident decisions to prioritize and focus resources. A structured approach is a critical aspect of any viable root cause process, keeping you from making assumptions that may not be true or overlooking things that should be factored in. Human performance aspects can be particularly challenging because they seldom result from malicious intent; however, Fred provides the tools to understand what can drive undesirable behaviors and get past the blame game. He reinforces the structured approach further by integrating “line of sight“ into the process, ensuring the original problem will be addressed by the solution. To accelerate practitioners’ understanding of concepts, processes, and results, Fred uses graphical presentations extensively. With these graphics, problems that seem to be overwhelming become focused and solvable. Usually, you will see that not all is broken; thus, you can efficiently identify the significant few areas that are driving performance in the wrong direction. Graphical presentations also accelerate the organizational (including management) buy-in and understanding of both the problem and the resulting corrective action plans. Fred would say that you can’t fix everything with a hammer — sometimes you need a wrench or a screwdriver. Because tools appropriate for determining the causes of equipment problems are not always applicable to organizational performance or cultural challenges, Fred provides the range of tools necessary to analyze and correct a problem. For example, a corrective action plan that addresses an equipment problem can be fairly straightforward, whereas changing behaviors typically requires a series of steps, over time, to successfully sustain the change. The final challenge for the practitioner is, “Did you fix it and how can you tell?” The book recognizes the need to know and integrates the follow-up steps necessary to assess effectiveness and sustainability. While there are other good root cause processes out there, Fred recognizes some of their limitations, taking them to the next level by offering a state-of-the-art approach. There is substance, without the “bells and whistles” that don’t add value. Following his approach will result in an efficient, effective analysis of a problem and a durable result. For example, in that earlier discussion regarding the collective radiation dose, the root cause report with corrective action plans was delivered in less than two weeks due to the use of Fred’s method. The results have been sustained for more than 15 years! Over the years, Fred and I have changed employers, but we continue to collaborate. In my own career, a primary focus for my company is assisting the interaction of clients with the regulators. I am convinced that there is nothing more powerful than a good root cause analysis to manage the resolution of significant regulatory concerns, and applying Fred’s approach can get you back on track to address the safety concerns as well as restore the regulators’ confidence. Using the factors you uncovered in Step 2 (Investigate the Factors) about the incident, you will start using those pieces of information to clearly illustrate the sequence of steps that led to the problem. You will need tools to concisely document the initiating actions, inappropriate actions, errorprecursors, flawed defenses, and organizational weaknesses to ensure decision-makers have a complete story of the incident. Four techniques are explained in Step 3. Implementing these techniques in an investigation will help you reconstruct the story behind an incident. Use fault tree analysis to diagram the possible ways a piece of equipment could have failed. Perform task analysis to understand how people normally do a job. Pinpoint the most important and risky steps in the work using critical activity charting. Display the progression of the incident on a timeline using actions and factors charting. A well-developed fault tree will help reveal the physical roots of an incident. Task analysis and critical activity charting will expose the human roots of a problem. Finally, actions and factors charting will assist in identifying he latent roots — the underlying programmatic and organizational weaknesses — that allowed the business to experience an accident or incident. HOW did each action happen? WHAT were people involved focused on? WHEN and WHERE did each pertinent action occur? If you are investigating a significant incident that involves machinery, it is generally a mistake to believe you can get to the underlying human issue before you have established what the equipment problem is. For example, a driver involved in a vehicle accident may have a percentage of alcohol on his or her breath, but the actual cause of the vehicle accident is a broken steering mechanism. Both the problem with the alcohol and the steering mechanism need to be addressed, but if you focus solely on the person’s use of alcohol you will miss the problem with the machine. Generally speaking, make sure you have pinpointed the hardware problem before you make any conclusions about the people portion of the problem. An incident can appear to have been caused by an operator’s error when there is a more important design flaw or installation error that needs to be found and corrected. Using a fault tree for equipment problems will ensure you consider all the potential equipment and human performance concerns that may have caused an incident. When a worker appears to have difficulty performing a job such as operating a piece of equipment, a task analysis is needed to identify any gaps between the desired or expected performance and the actual performance. If there is a variation between the work as planned and the work as done, determine why the difference exists. As you establish what should have happened versus what actually happened, graphically display actions and key decision points in time sequence. In order to establish cause and effect, the cause must precede the effect (in time). You also need to make sure that you and others can see the connection between a cause and its effect. Did the cause trigger the effect? Did the cause allow a condition to exist? Did the cause aggravate the outcome of the situation? It is also necessary to determine and study the more important steps of a task. These are steps where potential threats and existing hazards could interact to cause an accident. These are actions that have to be performed for production reasons; so businesses generally have workers take extra precautions at these critical steps. Use a critical activity chart to determine how an important task is performed and what safeguards are used or available at that step. Also determine any worker attitude or belief that might cause the production importance of the task to prevail over conscious consideration of the hazards associated with the job.